I’ve come to believe that every family is like a country unto itself, each with its own culture and customs, each member of that family a citizen of a singular homeland. In all our interactions with “foreigners” — that is, anyone who is not a member of the family in which we were raised — we come as ambassadors and interpreters from our native land. Edward Ball’s "The Genetic Strand: Exploring a Family History Through DNA" examines how the science of DNA can both illuminate and blur our understanding of “what really happened.” In "The Genetic Strand," Ball (whose National Book Award-winning "Slaves in the Family" explores the lives of both his slave-owning ancestors and the people they enslaved) discovers a drawer in an heirloom desk filled with locks of hair collected from long-ago family members. Ball turns to DNA analysis to see what light it can shed on his discovery, and in particular, whether it can answer long-lingering questions about the parentage of some of his ancestors. His results are mixed (and it’s worth considering how much the science of DNA has advanced since Ball published this book in 2007), but they raise interesting questions about the relationship between science and family anecdote: What can be proven, and what remains speculation, when science gets involved? 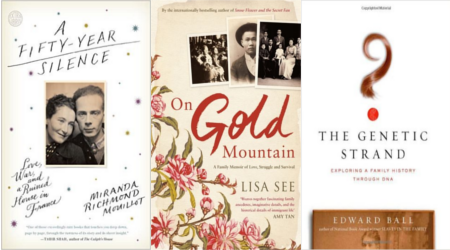 Lisa See tackles the transoceanic saga of her Chinese and Chinese-American family in "On Gold Mountain: The One-Hundred Year Odyssey of My Chinese American Family." See is perhaps best known for her historical fiction — including "Snow Flower and the Secret Fan" and, most recently, "China Dolls." However, the experience of writing "On Gold Mountain" — See’s first published work, in 1995 — set the direction for her subsequent career. "On Gold Mountain" is a vivid portrait of not just a family, but also the society and times in which they lived. As Chinese residents in America in the late 1800s and early 1900s, See’s great-grandfather Fong See and his family faced systematized racism that made their hard-won prosperity in Los Angeles’s Chinatown precarious. The family’s enduring ties to China, and a tradition of interracial marriage — even at a time when such marriages were illegal — adds to the rich complexity of See’s well-researched and clear-eyed account of her family. In "A Fifty-Year Silence: Love, War, and a Ruined House in France," Miranda Richmond Mouillot seeks to solve a mystery that has shaped her own life profoundly: Why did her grandparents — both Jewish survivors of World War II — separate and never see or speak to each other again? Mouillot’s thoughtful memoir paints a rich portrait of two highly accomplished individuals. Her grandmother was a physician, and her grandfather served as an interpreter at the Nuremburg Trials; they each, ultimately, had to find their own way to live with having survived the war. What Mouillot’s investigation turns up is a compelling account of the weight that History with a capital “H” can bring to bear on ordinary lives, and how that can resonate through generations. — Melissa Fisher Isaacs is the Information Services Coordinator at Lawrence Public Library.